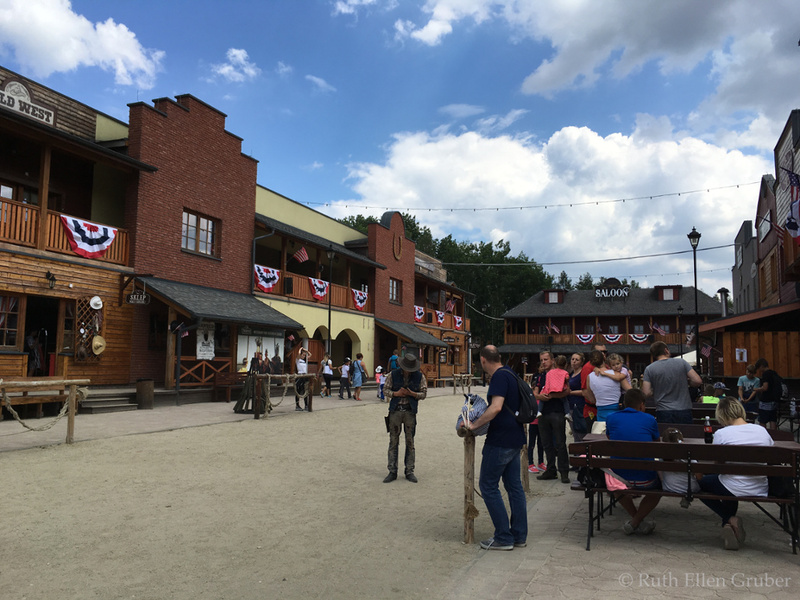 I managed to get to two Wild West theme parks this summer — “Twin Pigs” in Poland, and the Western Park (once called Wild West City) outside Boskovice in the Czech Republic. 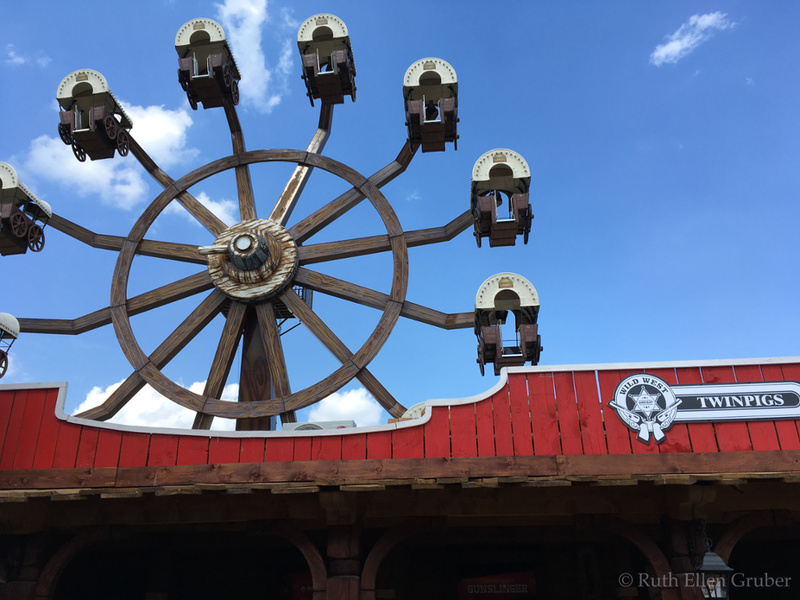 I’ve visited a number of wild west theme parks in Europe over the years — they are key elements in the Imaginary Wild West. Real Imaginary spaces that have grown out of dreams, passions, stereotypes, and yearnings — but also help create them. 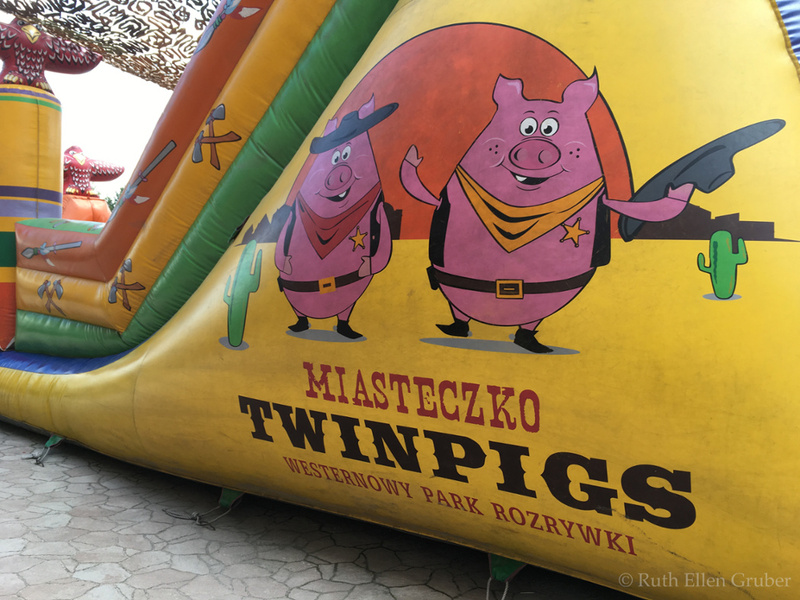 This was my first visit to Twin Pigs — but the latest of several to Boskovice. The Boskovice park was founded in 1994 as a private initiative by a local man, Luboš “Jerry” Procházka, who developed the park in a natural setting in and around a disused sandstone quarry. The first time I visited — in, I believe, 1997 — it was out of season and the park was closed; I could only look at it over a fence. 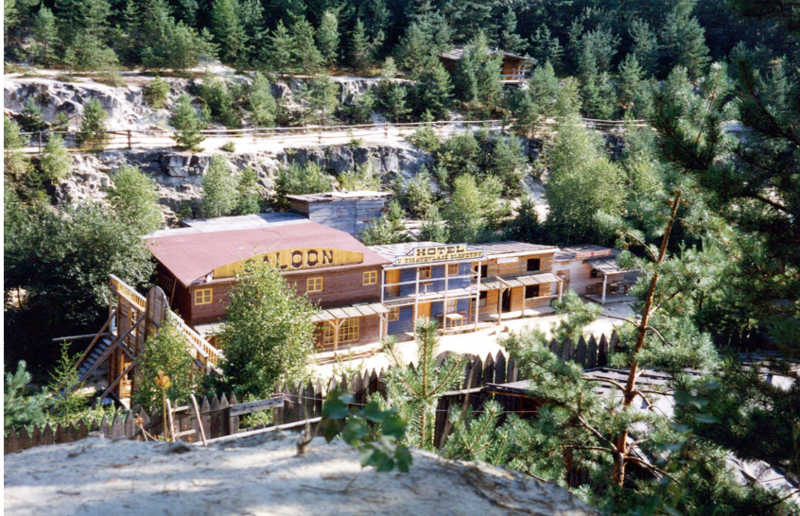 But I was struck by the view of the saloon and other movie-set buildings. Some people compare Europe’s current interest in Jewish culture with the United States’ interest in Native Americans. To be sure, I have seen Indian dolls wearing beaded costumes for sale in the Denver train station that reminded me of the “Jewish” puppets and figures I have photographed in Prague, Krakow, and Venice. I was not surprised, therefore, by two posters I found on display in the Boskovice tourist office. 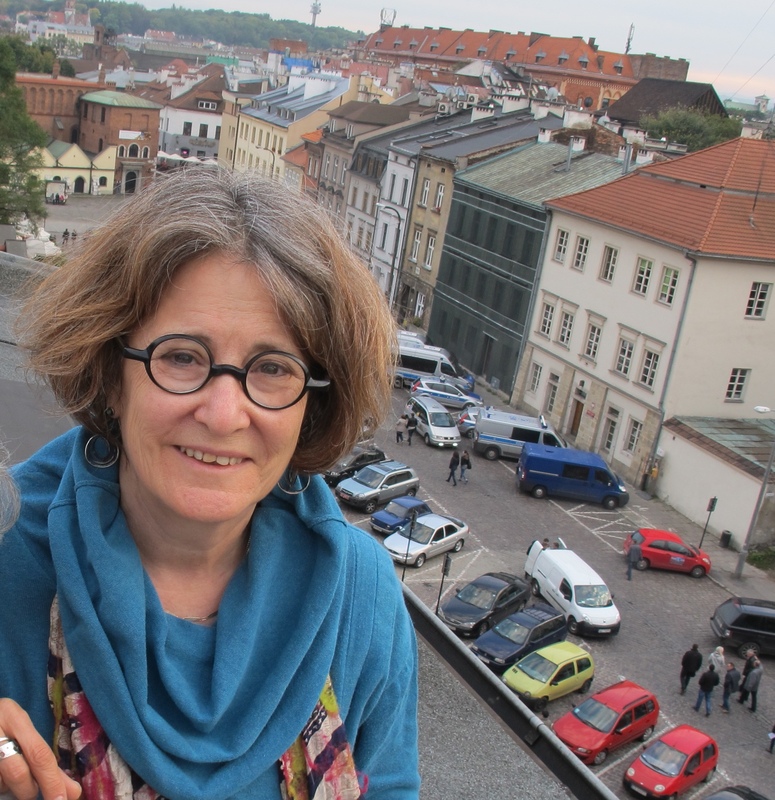 One is for a jazz festival whose proceeds are to go toward renovation of the Jewish quarter. 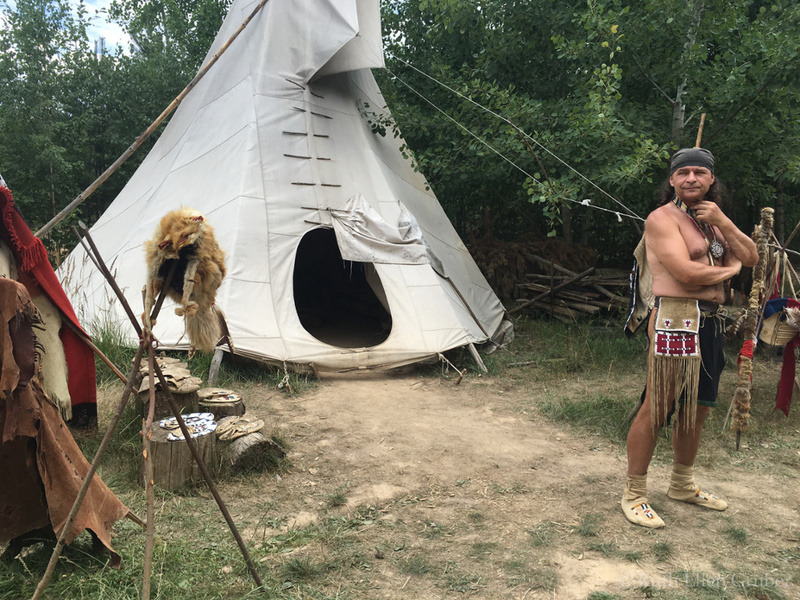 The other advertises a rodeo at a place called “Wild West City: Boskovice’s Western Town.” It features photographs of people dressed up like American Indians riding horses, with corrals, rickety wooden structures and even tepees in the background. A handbill shows a seductive Indian maiden looking over her shoulder. I found Wild West City on my map, the edge of Boskovice, and stopped there on my way out of town. 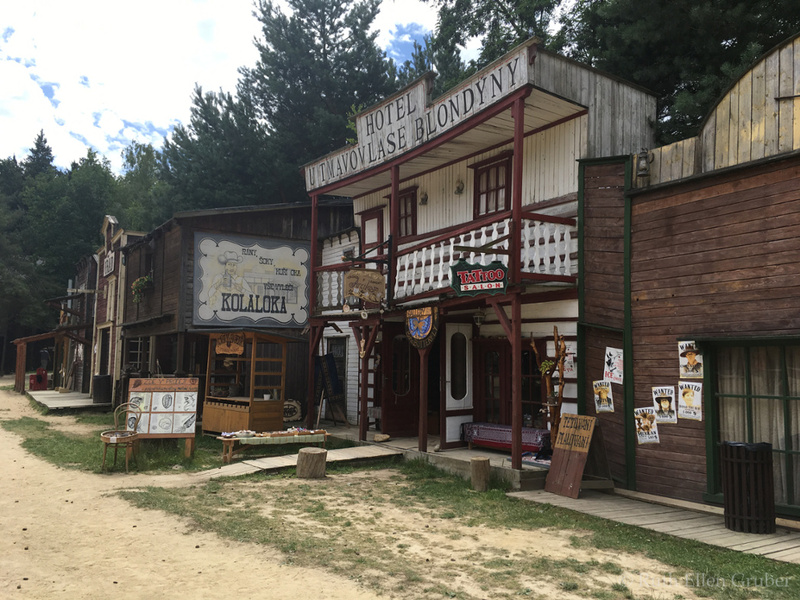 It is a theme park set up in an old quarry that resembles a stage set from a John Ford movie, replete with a flimsy wooden saloon and general store. A sign at the entrance reads, “Indian Territory.” Another notes the kilometers to various spots in the American West — most of them spelled incorrectly. It’s off-season The place is deserted. 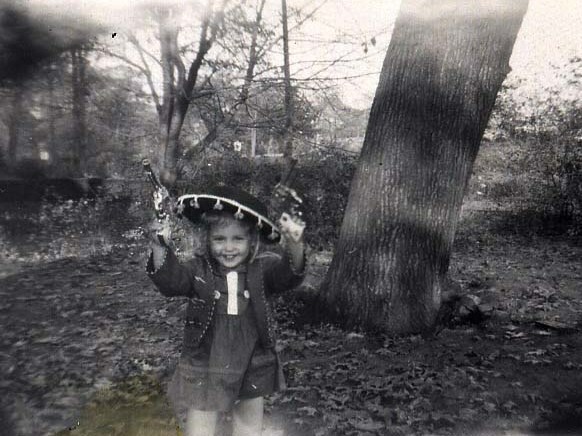 The only sound is that of hoofbeats, as a costumed employee rides a horse round and round the repro corral. 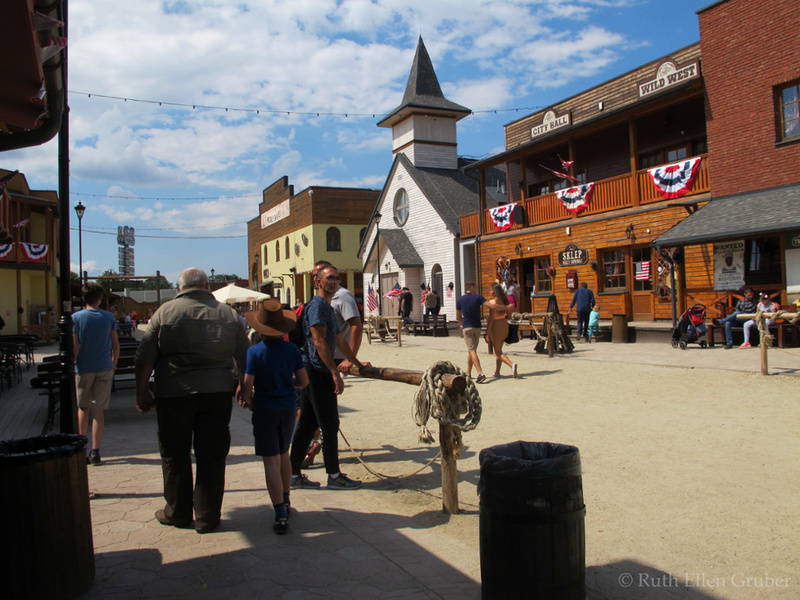 On subsequent visits over the years, I spoke with Jerry — who is still the owner and managing director — and observed the town “in action.” It includes the usual wild west tropes — a “main street,” saloon, “boot hill”, bank, “Indian Village” etc. But I’ve always found it much more low key and laid back than some of the others I have visited — there’s a dusty slightly rundown feel — though I did notice on my visit this July that some of the buildings had been repainted since my last visit. There also seemed to be more activity elements aimed at kids. The imagery is based on US western movies and Karl May books, but it also is influenced by Czech tramping tropes. 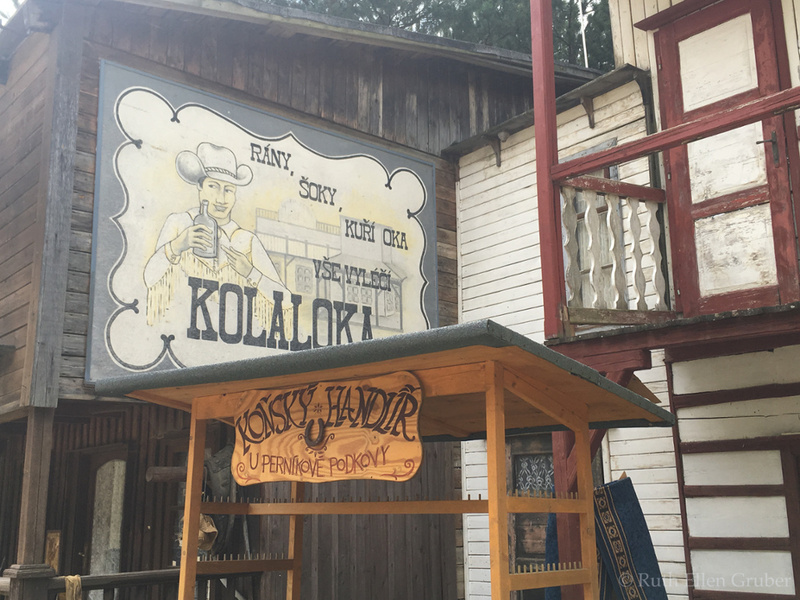 The Czech movie Lemonade Joe, a 1964 spoof of the singing cowboy genre, also plays a role — in particular with the big “advertising” mural for “Kola Loka” — the sarsparilla type drink enjoyed by the movie’s hero. 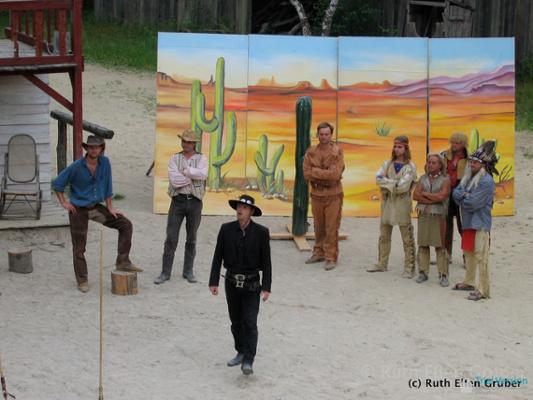 The park includes an outdoor theatre where live performances take place — I didn’t see one this summer (it apparently was based on the shootout at the OK Corral) but some years back I took in a performance based on Karl May’s Winnetou characters. 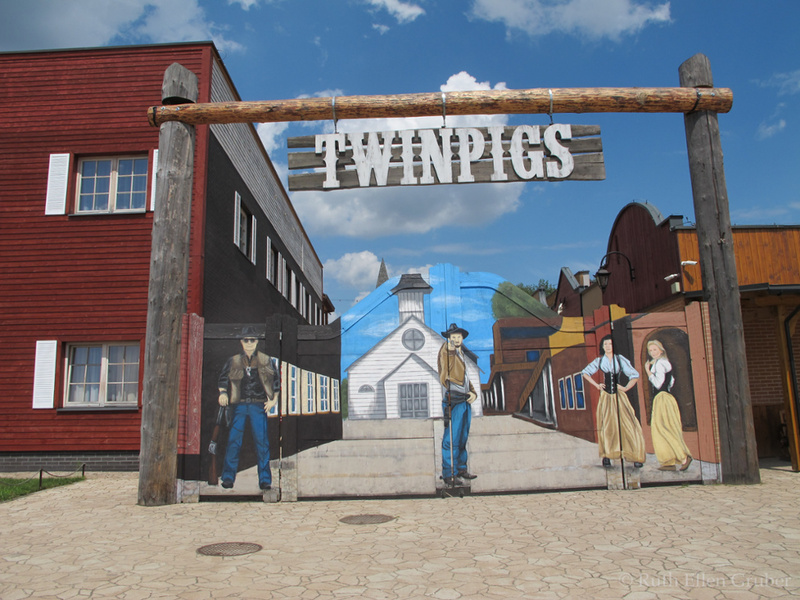 Twin Pigs, located in southern Poland near Zory, off a main highway, is a somewhat different story, It employs the same general skeleton, but has quite a different feel: a purpose-built construct born out of a commercial business plan rather than from personal passion. 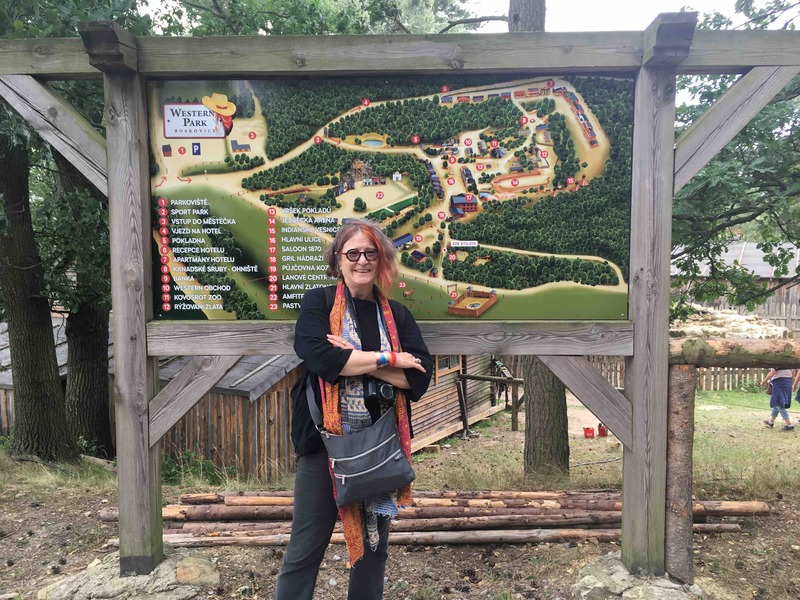 Opened in 2012, it is described as an amusement park, and it is much more “top down,” planned out, and hard-edged than Boskovice, with its grassroots origin and — despite recent improvements — still rather amateur feel. There is a regular lay-out along the Main Street, and also a ferris wheel, roller coaster, and other rides, restaurants, a 5D theater, and children’s activity trails. Lots of red-white-and-blue bunting and American flags (and a few Confederate ones, too).